Hello all! It’s been tooooo long since our last chat! Warning: excessive use of exclamation points may be used throughout this piece as we have just turned the bus into the wind and are heading west. Final Destination: California aka HOME!! 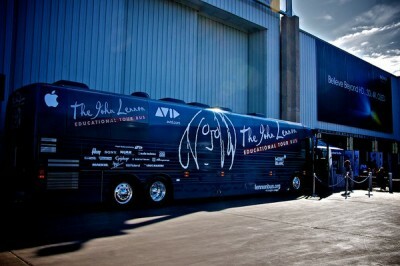 The Lennon Bus has officially ended its 2011 tour and will be heading into the shop for repairs and upgrades while the crew trains for 2012! To say we’re excited to see what next year brings with the production of a Lennon Bus Europe would be a massive understatement. Moving on… to continue from our last discussion, we ended on integrating Sibelius and the Scorch app with your songwriting communication. And before that we provided you with a method to capture that initial inspiration with the Garageband app. The next step? Getting your composition to become truly immortal! One of the beautiful things about recording a song is the realization that by storing it in a digital format (or analog if that’s your style) you are in fact creating something that will last longer on this planet than you will. A weird thought, yes, but its something that many artists don’t realize and often forget. After you’re gone and this recording is something you’ve left behind, what do you want people to think and feel after hearing it? I digress. As you may already know, there are multiple DAW’s these days to capture a performance with, but the industry standard worldwide is Avid Pro Tools. Now when it comes to using Pro Tools, it is a known fact that until you reach a certain level of comfortability with the program it is a rather technical operation to run. Compare that to writing, arranging, and performing a song, which is an extremely creative operation. I’m no expert on neural processes but I’m quite positive that the creative and technical portions of your brain function on complete opposite sides. It’s so hard to combine the two! And when trying to record and perform at the same time you need to limit the amount of switching as much as possible. This is where the AC-7 Core app from Saitara Software comes in. This app allows you to control Pro Tools from the safety of your iPad, with movable faders and knobs for adjusting levels, pans, mutes, scrubbing, and full transport control. Imagine you are laying down a guitar track in the best sounding corner of the room, your computer is at the other end, and you couldn’t move if you wanted to as you’re surrounded by microphones. Load up AC-7 on the iPad and your wireless control of Pro Tools is good to go! Or perhaps you are recording a band, but you’re the only engineer. As you walk back and forth between the control room and the studio, you move mics around in the room and record their various locations, playing back on the fly to find the best sound. Endless possibilities! And when it comes down to it, anything that furthers your knowledge of recording and Pro Tools will in turn allow the program to cease as a technical process and allow it to become the amazing creative instrument that it truly is. Just to clarify, magic is in fact not real (although Santa Clause DOES exist) so the app doesn’t automatically connect to your computer upon opening. 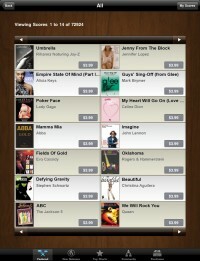 However, the setup whether on Mac or PC is very easy and Saitara has down a wonderful job of supporting the software. I’ve included a video of how to setup below, along with a specific setup for Pro Tools below that. Enjoy the app everybody and cheers to all! Chapter two! 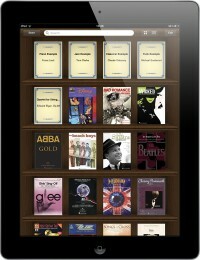 As you may remember from my last post we focused on the iPad app known as Garageband. This provided an easy and efficient way for beginning or mobile songwriters to get their ideas out. So at this point we have your song, which you can now travel around listening to. You enjoy it more and more every day and it’s mixed just the way you like. A great point to be at but there’s one problem: it’s exclusive to one person… yourself! You’ve just realized you want to share this song with your friends who also play instruments with the intention of seeing how they could contribute to the components that make up your song. Option 1: You gather your friends together and explain to each of them the melody, the chordal movements, the arrangement, the key and tempo. All the while doing your best to translate for each specific instrument. Unfortunately you keep hitting snags whenever a particular question arises regarding a part of your tune that wasn’t properly communicated. 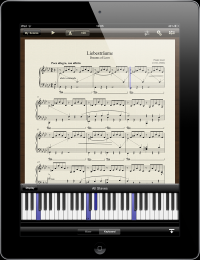 Option 2: Utilizing an iPad equipped with the Avid Scorch app in conjunction with Avid Sibelius, you create a notated document of your song also known as a score or sheet music. This score has all the notes written out for each instrument with clearly indicated sections for your arrangement i.e. intro, verse, chorus, bridge, etc. You now have an exact representation of the song within Sibelius, which you can then upload to Scorch and have your song right on the iPad in front of you. Hold on a sec… I can hear the questions coming through the computer at me right now. “But Hans!” you ask, “what if every member of this unique and awesome band lacks their own iPad to view this beautiful score I’ve created?! Why don’t I just print it out directly from Sibelius?” Keep calm little one. This is where the Scorch app truly shines. You not only have the ability to have Scorch play the score for you with the option to solo various sections, but you also have the ability to transpose to any key you want. Vocalist not feeling the key you’ve written the song in? 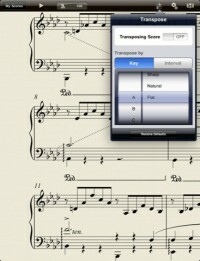 Transpose the score to fit his or her range. Bassist confused about a line? Isolate the part and have the player hear it directly. Any trouble from there and you can just hand the musician the iPad to see for themselves what ultimate confusion busting looks like! On top of all this, you have the ability to mix the song on the fly to your taste. All while staying in the comfortable space you are jamming in as opposed to crowding around a computer. Gotta love technology. And now for my favorite part: dissecting what the main thing wrong with option 1 was and how we can incorporate its solution into what we do on the Lennon Bus. Lets use Math as our analogy. Mathematics is referenced as the one true universal language as it does not rely on any syntax derived from French, English, Spanish, Latin, etc. It is its own language autonomous of any region or country that can therefore be spoken worldwide. Music notation is the exact same. Having your notated song in Scorch you are now able to take this score to any musician in the entire world and have them immediately recognize how your song is played. This cuts the time passed from explanation to understanding by a significant degree. Everything we do in our recording sessions on the bus has to be done in an equally efficient manner. When students or artists come together to record a song, so much time can be wasted trying to communicate how the song is played. Especially when dealing with a pre - written tune i.e. recording a cover. Having Scorch handy on the iPads with the quick option of loading up the sheet music and playing that song back, transposing that song on the fly if needed, soloing certain sections for better clarity, the list goes on. In the end the result is a HUGE time saver. And that, my friends, is absolutely invaluable whether you’re on a bus or not. Below are some pics highlighting various functions of the app. I’ve also included a tutorial of Sibelius should you choose to dig deeper into your musical notation endeavors. Enjoy learning one of the few universal languages around! to the bus every year, equipment which has become integral to achieving our daily mission. I don’t know about you, but when the iPad was first announced I had extremely low expectations for its arrival. I initially pegged it as an oversized iPhone, reminding everyone of the fact that tablets had their go some years back and failed miserably. Man, was I jaded! After spending a significant amount of time with the “iDevice,” I’m currently of the belief that this thing is the absolute future of a number of industries, and may or may not lead to the singularity. Most pertinently, however, I strongly believe it can change education forever, and for the better. Imagine at the start of kindergarten, High School and College that you are given an iPad, complete with all of your lessons, books, homework and projects for the entire year. Any of which can be updated or added to at any time. The cut in costs of foresting each year would aggressively decline, the current book selling scam would disappear, each students interaction in class material could triple, the list goes on! That’s one example, but lets now apply it to the bus. At the beginning of the day, we always spend the first hour getting to know the students that we’re going to be working with. Part of that hour is spent determining the type of song they want to produce, consisting of its overall feel, tempo, key, and message. Normally, we just talk about it, and then bring the students to the back studio where we open up Pro Tools and start working our magic. This is all good, but utilizing the iPad with Garageband, we can put the magic in their hands, and have them determine just with the touch of their fingers what the song is going to be. Key example: within Pro Tools, setting the tempo of the song involves expanding your Tempo ruler, double clicking the tempo breakpoint within that ruler, and then hitting T to tap the tempo until you have a BPM value. This is easy and intuitive for those that know the program, but may seem a tad daunting in the eyes of someone who’s never even seen recording software before. With the iPad, there is a giant button on the screen that reads “Tap Tempo” with a BPM value being stored right next to it. All you do is tap the screen to the beat you hear in your head and you’re done. We could easily teach them how to do it within Pro Tools, but the iPad method is intuitive for anybody without any previous knowledge of engineering or recording software. It allows us to essentially add a step before going into an HD medium like Pro Tools, and ease them into the more technical aspects of song creation, while maintaining their interactivity with the project. And at the end of the day, having every student leave the bus with a high sense of contribution to the final result is extremely important. After setting tempo, it is just as easy to set the song key, and lay down a few riffs on the various built in instruments that come with the app. When we pass around the device so every student has a chance to add their input, we have a quick and efficient way of working out the initial foundation for a song, from which we would then take into Pro Tools HD and make it sound bangin’! To see for yourself how easy the process is, watch the video below. And check back here every week to see more content coming from the boys on the bus. Check back next time where I’ll be displaying Scorch, a sweet little app from our friends at Avid who have made song transposition on the iPad all too easy. There is nothing traditional about working for a travelling recording studio. As you may already know, this particular studio bus takes part in activities throughout its yearly tour that make it impossible to think of it as a “normal studio”, as in one you would see in Nashville or Los Angeles. Between the student sessions, public tours, music festivals, celebrity interviews, and many other interesting events we apply this bus to, we have to be constantly adaptable, able to serve multiple purposes at any time. Hopefully you’ve been keeping up with our activities, and are familiar with a particular type of recording session we do, known as a Lennon bus Live. Traditionally, this involves a band that has won some sort of contest, where the included prize is having the opportunity to come on board and take part in recording their song in a full HD professional studio, while simultaneously capturing the performance on video. In the end the band has an HD music video they own the rights to, and can do whatever they want with free of charge! Pretty sweet deal, I know. But enough of that Jazz, this blog is pertaining to a recent Lennon bus Live that occurred in Cuyahoga Falls, Ohio, which was a little different from the rest… we only had one winner to work with! Number one lucky guy Kevin Cedar got the chance to come on board and get his very own Lennon bus Live session. As you are now familiar with the definition of these sessions, what ever is the Lennon bus crew to do? With the power of ingenuity, we were able to turn this soon to be superstar into a one-man band of sorts, achieving the same look and feel of our Lennon bus Live styling. Using Media Composer as our tool, the creative concept was allowed to move into reality. Watch the final result youtube.com/johnlennonbus, then check out the video below to see how I did it. Gotta love it! You are invited to spend a full week in Las Vegas with comped rooms at the Mirage Hotel and Casino, where you are placed at VIP status, which includes a free ticket to the 5th Anniversary Beatles LOVE show, seated in the artist section, at the same show where every single person that had a major part in the career of the Beatles as well as the making of the LOVE show (which includes Paul McCartney, Yoko Ono, Sean Lennon, and George Martin) attended as well. If there were every a sentence that was deserving of run-on status I believe it’d be this one. The only catch to all this? You have to: conduct public tours of an awesome studio bus for 5 hours every day, give interviews to local news stations, record a sweet track and video with a couple of cats from the local Boys and Girls club, setup and record interviews of Yoko Ono with Gayle King, The L.A. Times, and Mont Blanc, and you have to giveaway Epiphone guitars signed by Yoko to a few lucky winners, which can be seen below! Does this even qualify as a catch?? Not even debatable. In case you’ve not deduced by now, this is exactly what the bus experienced this past week in Vegas. Seriously, we need to give a HUGE thanks to The Mirage Hotel and Casino, The Beatles LOVE Show, Mont Blanc, and Epiphone for allowing this organization to carry on with its mission, affecting peoples lives all over the country. You are whats makes this all happen so thank you again! Happy Mothers Day From The Bus Crew! From all of us at the Lennon Bus, we’d like to take this moment to wish our mother’s out there a Happy Mother’s Day! For this special occasion we have a little treat as a gift to show all you mother’s out there how much we appreciate all the time and energy that YOU have put into making a beautiful person. This past week, Camp Tyler phase two was in full swing, as Hans was yet again put through the paces of bus life, this time focusing on video production, bus lighting, camera operation, and the final edit. And to top it all off, legendary music producers “Two For One” (consisting of Fitty Percent Off and Q-tip Sale) stopped by the bus on the last day of shooting. They were more than happy to contribute to the training, and we couldn’t be happier with the final result! Utilizing our Sony Anycast Station, the video was cut via live switching directly to Avid Media Composer. To all you coupon clippin mommas out there holdin down the good shopping discounts for your kids, this video is for you! The Overtown Youth Center, or OYC, which we’re pretty sure should be named the OOC (for Out Of Control) was one of the bus’s favorite stops of last years tour. The kids at this youth center are EXTREMELY enthusiastic to say the least, and their energy is something the crew travels this country searching for. In fact we didn’t even have to run the generator yesterday, as the bus just ran off high octane OYC expressive electricity. As the students learned, sang, danced, and played music with us, they had no idea of their inadvertent ability to fortify the bus with enough energy for the next month! Probably two. Thank you to the staff and students who helped make yesterday another great stop for the bus. We can’t wait until next time! To say that Las Vegas was an absolute trip would be an understatement. Thanks to our good friends at Avid, the bus was lucky enough to attend NAB (National Association of Broadcasters), a convention gathering business savvy individuals from all over the globe. And it just so happens that they like to convene in one of the craziest cities in the world. 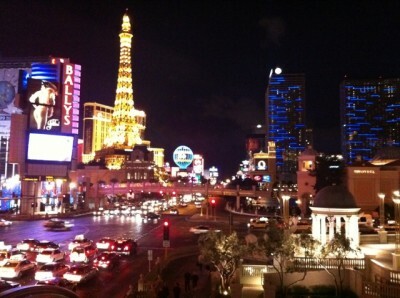 Vegas baby! If that doesn’t follow the “work hard party hard” mentality then I don’t know what does. Not to be an exception to that lifestyle, the crew had the chance to experience the city after many hard days of work. And lucky for us, we were greeted by an old friend of Kevin’s… Mamoody! He decided to give us an in depth look at the history of the Eiffel tower in Las Vegas.